Tooth Pain: What Could It Be? A tooth with an abscess can lead to a lot of pain. When you have an abscess this means that there's an infection deep within the root of your tooth. You will have noticeable swelling and, of course, plenty of pain that may make it tough to chew on the infected side of your mouth. In addition, if you have a fever, the infection has spread into your jaw and may turn into a septic infection throughout your body. To deal with the abscess, your dentist will need to drain the abscess and prescribe a round of oral antibiotics. Dental cavities are a usual suspect when it comes to tooth pain. And while you may think of cavities as a routine dental problem, they can turn into larger issue, like an abscess, if you don't take care of it. When caught early, a cavity can be easily cleaned and sealed with a tooth-colored filling or other restoration. The hinge of your jaw is known as the temporomandibular joint or TMJ. 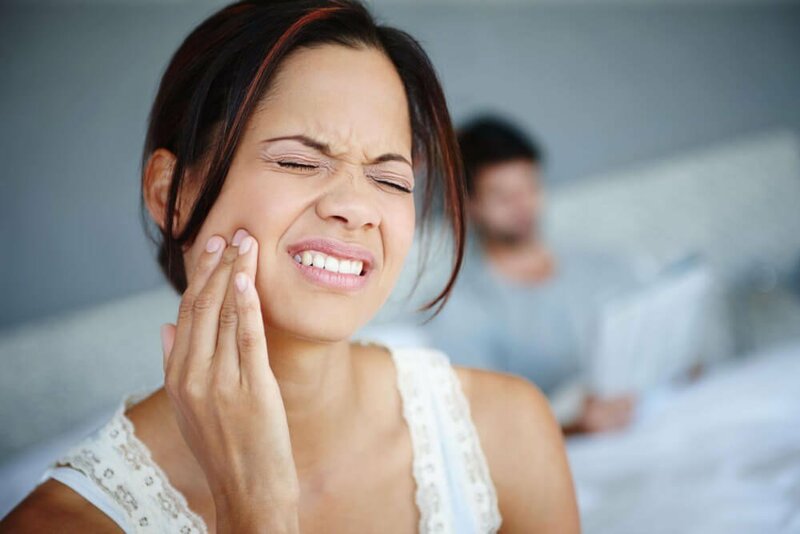 Clenching your jaw, either as a response to stress during the day or during the night when you're asleep, it can lead to temporomandibular joint disorder (TMD). This can alter the alignment of your bite causing head and toothaches, as well as other problems. DentalWorks in Macedonia, OH offers many treatments for TMD, including night guards. Once your TMD is diagnosed, your dentist can develop a personalized TMJ therapy plan to alleviate your pain. People have different responses to pressure. If you are gritting your teeth off and on for hours through the day, you may eventually develop tooth pain. You could also have nocturnal bruxism, which means that you are unconsciously grinding your teeth in your sleep. Teeth grinding damages your dental health, eventually leading to pain, weakened enamel, and tooth fractures. After diagnosing your bruxism, your dentist can develop a custom treatment plan to first stop the damage created by grinding and restore the strength and health of your teeth. Lots of people have older metal dental fillings that don't bond as well to enamel as modern fillings. A loose filling can actually cause other issues in your mouth fast. Food and bacteria sneak into the crevices beneath your restoration causing irritation, infection, and decay. Keep in mind that you do not necessarily have to feel or see a loose filling. The movement of the restoration could be small. You may not even know you have a problem until your dentist finds it using an x-ray. If you still have amalgam fillings, talk to your dentist and have them replaced with tooth-colored fillings before you have tooth pain. Whether you're straightening your smile with metal braces or clear aligners, you will most likely feel at least a little tooth pain. After braces are tightened, there's typically a period when your teeth and gums are very likely to be a little raw. Changing to your next set of aligners also tends to make your mouth feel tight for a few days as your teeth get used to the new trays. We suggest that you talk to your dentist or orthodontist about suggestions to reduce discomfort with over-the-counter pain relievers and other home treatments. Extreme pain or concerns that last longer than a few days should be reported immediately since it may be an indication of a significant problem. Once you've had a sinus infection or severe seasonal allergies, you know the discomfort of throbbing sinus pressure and headaches. Your teeth (particularly you upper molars) are very close to your sinuses so you may feel tooth pain if you have an infection in your sinuses (sinusitis). You will need to see your physician to treat the infection. As soon as you have your sinus infection under control, your facial and dental pain should let up for some well-deserved relief. Store-bought teeth whitening products, like whitening strips, can make your teeth feel sensitive after application. Using too much whitening solution and whitening solution getting into a damaged tooth can be reasons why your teeth hurt. Instead of risking tooth pain, sensitivity, and uneven results, schedule a consultation to get more information on professional teeth whitening. DentalWorks in Macedonia, OH offers both home and in-office professional whitening options customized to suit your goals and special needs. Occasionally, you may feel a spot in your smile that delivers a jolt of pain when you drink hot coffee or enjoy a bowl of ice cream. Sensitivity to hot, cold, and sweet can be a sign of a larger dental problem, for example a cavity or exposed nerve. You should schedule an appointment with your dentist if you have chronic tooth sensitivity so the underlying issue can be identified and repaired. If you are in a car accident or endure a sports-related injury, the impact to your teeth can lead to a crack, chip, fracture, or even the loss of a tooth. It is best to have your teeth checked during your next dental appointment if you suffer an injury to your mouth and lower face. To protect yourself from sports-related dental injuries, Dental Works in Macedonia, OH offers custom athletic mouth guards. Your wisdom teeth, or third set of molars, typically develop after all of your other teeth are in place. When they start to erupt (around the age of 17 – 21 years old), you likely don't have enough room in your mouth for them. This is why the wisdom teeth are usually removed. Though when they first appear, wisdom teeth can give you trouble. You may feel anything from a general soreness to an overbearing pain that will not resolve itself without treatment. Your jaw may appear swollen and feel sore throughout the eruption progression. With modern extraction techniques along with sedation, removing wisdom teeth can be an easy process that saves you from far more pain in the long run. Keeping your wisdom teeth increases the chance of developing cysts, nerve damage in your jaw, and a more invasive removal technique. As soon as you feel any discomfort, you should schedule an exam with your dentist to have the problem diagnosed and repaired. If you're fighting through the pain because of dental fears or anxiety about the prospect of an invasive procedure, ask about your sedation options. DentalWorks in Macedonia, OH uses the most advanced technology and techniques to minimize your discomfort during your appointment, but we also provide many different levels of sedation. And bear in mind that most dental problems will not heal on their own, so the longer you wait, the bigger the problem becomes, which may lead to a more invasive treatment. If you really want to avoid wasting time and money in the dentist's office, schedule twice yearly appointments at DentalWorks in Macedonia, OH for cleanings and an oral health exam. This allows your dentist the opportunity to recommend proactive solutions like dental sealants, professional fluoride treatments, and more that will reduce your risk of developing oral health conditions in the first place. Like Benjamin Franklin said, "an ounce of prevention is worth a pound of cure."